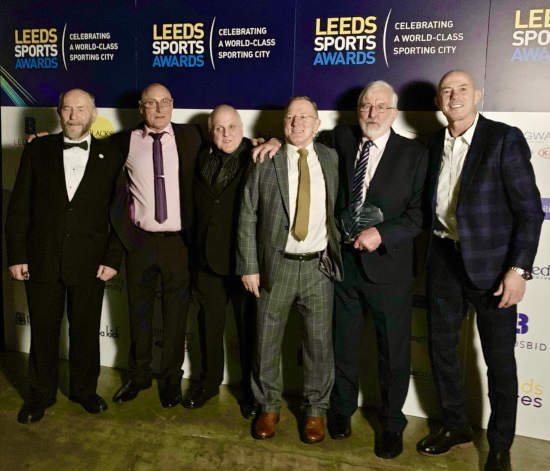 West Yorkshire Judo’s own Roy Francis was nominated for the “Outstanding Contribution to Sport Award” at this highly prestigious awards ceremony which was held on Thursday 28th February 2019 at the First Direct arena in Leeds and was covered by local news channel BBC Look North. There were over 850 attendees present. It was great to see Roy receive this fantastic award which goes a small way to recognise the herculean effort put in by this immensely modest man who epitomises the ethos of Judo. Roy is currently 5th Dan and has been involved in judo since the 1950’s running Aireborough Judo Club 2 nights a week and you will see him still volunteering at just about every dan grading or competition in the area. Roy was accompanied to the event with his wonderful family and members of the West Yorkshire Judo Committee. It make me incredibly proud to see volunteers like Roy receive the recognition they deserve for the tireless work they put in year after year.